Utah news outlets have reported in recent days that the investigations into the activities surrounding indicted e-market and online-poker “Black Friday” payment processor Jeremy Johnson now include a new target of ongoing bribery allegations in retiring US Senate Minority Leader Harry Reid (D-NV). The investigation into possible bribery payoffs involving Reid have been specially designated to Davis County District Attorney Troy Rawlings, after the state’s Attorney General’s office recused itself from investigating the matter, citing potential conflicts of interest. According to the possibly-partisan Utah reports, the investigation into Reid continues a battle between Utah’s state investigators and their federal DOJ counterparts, who have been repeatedly accused of being significantly less than cooperative in forwarding information connected to the Reid allegations. Reid is one of several prominent politicians to have been accused by Johnson amid a larger series of bribery allegations and pay-to-play schemes which have resulted in corruption charges against two prior Utah attorneys general, Mark Shurtleff and John Swallow, with Swallow forced to resign his role as Utah AG amid various schemes involving Johnson among several other business relationships, along with an alleged wanton destruction of evidence. Johnson’s secret taping of an hour-long meeting with Swallow in an Orem, UT donut shop eventually became public amid Johnson’s own legal battles with the government over the alleged fraudulent operation of his iWorks e-marketing empire. Several other co-defendants in that 2010 FTC-brought, $275-million trial have reached plea deals, but Johnson’s battle rages on, and is now scheduled for a trial in February of 2016 barring further delays. Yet Johnson could well be described as the non-indicted 12th defendant in the April, 2011 Black Friday online-poker case as well. The reason Johnson wasn’t charged in that matter along with his SunFirst bank and other payment-processing co-conspirators is that Johnson (allegedly) freely commingled the funds from his poker processing funds and companies with those providing similar services with his iWorks empire. Since the FTC already had a case pending against Johnson and four other co-defendants, that part of it was partitioned off, with the FTC remaining in charge of prosecuting Johnson’s alleged misdeeds. However, the allegations regarding Johnson either bribing or serving as a conduit for bribes to US Senator Reid remains one of the story’s major loose ends. Last March, FlushDraw detailed the two separate bribe allegations made by Johnson involving Harry Reid, which included a best-to-date translation of the related sections of the recorded conversation between Johnson and Swallow. Johnson himself admitted coordinating one bribe directed to Reid whose purpose was for investigators to go easy on him and his associates in the iWorks case, though it’s an open question as to whether any of that documented and self-admitted bribe money actually made it to Reid or his associates. The second case, though, focused more directly on online poker in its pre-Black Friday but post-UIGEA existence, when the largest US-facing online sites were moving from one shady payment processor to the next in the effort to keep the money channels open to American players. Actually, the last part wasn’t quite true. While Reid did propose the not-well-received Reid-Kyl legislation, which was actually a US-wide online-gambling ban with a very narrow poker carveout, it received plenty of blowback; the bill was abandoned by Reid in late 2012 without ever being formally introduced. Johnson: I’ll tell you this. We had a meeting with Reid, where he said—this was a private meeting—it was Reid, it was me, it was, you remember John Pappas? Remember him? Poker Players Alliance guy? Johnson: John Pappas [PPA Executive Director], and Ray Bitar, owner of Full Tilt Poker. Swallow: I hope so. I hope so. I hope I’m not the big fish or anything. Johnson: I mean, that’s the only thing I can think. Why would  Washington, DC have some person to investigate you. It seems to me like it would be an internal thing for the State of Utah to do it. If there was really some concern. Swallow: Yeah. Well, I’ll check with Richard [Rawle] and see. While Reid’s office has previously denied the allegations, one of Johnson’s payment-processing partners, the convicted “Black Friday” defendant Chad Elie has generally and repeatedly affirmed Johnson’s version of events, and even published photos showing several people related to the allegations hobnobbing with Reid at a 2010 political fundraiser in Las Vegas. 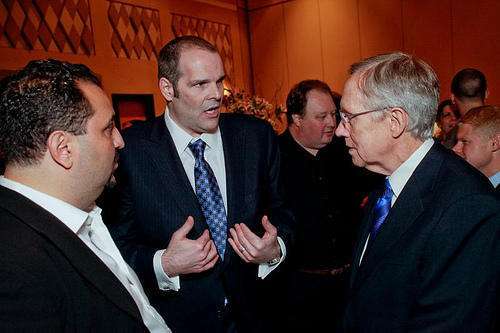 That’s former Full Tilt execs Howard Lederer and Ray Bitar chatting up Reid in this photo (notice Greg Raymer in the near background, though not in the FTP-Reid circle). Further, despite the allegations by Johnson and Elie — largely directed at former FTP bosses Lederer and Bitar — specifics about the supposed million-dollar bribe paid to Reid to float Reid-Kyl have yet to emerge in public. And, if that million-dollar cashier’s check existed, then who or what it was made out to will certainly be the entry point to another part of the Reid investigation. One other complication exists. Richard Rawle, a business partner of both Johnson’s and Swallow’s various times referred to repeatedly in the above, died a short time after the donut-shop conversation was taped, and is not known to have verified or corroborated any of Johnson’s bribery claims before his own passing. The public may never know if Johnson’s claims regarding the bribes are true, even though he willingly implicated himself by releasing the tape out of spite, a day after his own complicated plea arrangement with federal prosecutors fell apart. Should the bribe allegations turn out to be real, then they may also pose an additional legal problem for former Full Tilt bosses Lederer and Bitar, depending also on applicable statutes of limitations. As with the conduit for the alleged bribe, the specific date that the alleged bribe occurred has also not been made public, though it appears that it would have taken place at some point in 2010 and that at least five years have elapsed since its alleged occurrence.